Category Archives: Artistic Match Ups. Have you ever played a game of comparisons where you match up persons or things and try to decide which you prefer? I know we can’t or won’t really say who is the better artist but it is fun to take two artists who are contemporaries and match them up. 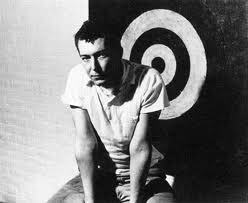 Robert Rauschenberg or Jasper Johns. 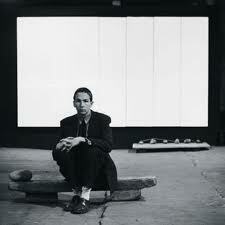 Robert Rauschenberg was born in 1925 and died in 2008 and is to many contemporary artists an infuriating figure. So many artists have been excited by some great breakthrough only to discover that Rauschenberg did it first. He was a painter, sculptor, photographer, printmaker, and performance artist. He is best known for his combines of the 1950s, and lesser known for many other works of art. He created so much and so many forms of art it is almost impossible to understand his achievements. It is sometimes said he stopped being an interesting artist after the early 1960s, yet his Cardboards and related pieces he created on Captiva Island in the early 1970s are an under known and exciting example of work by an artist who made use of everyday materials and junk that he found lying around on the street or in his studio. Rauschenberg’s prolific output might have contributed to his later work being overlooked. Also the sheer brilliance of the combines overshadows the great work he created before and after. His use of silkscreen could be said to be derivative of Warhol though Rauschenberg’s subject matter and technique with silkscreen painting is very different from Warhol’s. Jasper Johns was born in 1930 and is a painter, printmaker, and sometimes sculptor. He is most famous for his encaustic paintings, a medium that he helped to resurrect from the dead. His use of images such as the American flag, coffee cans, maps, and numbers has led him to be called a Pop artist though he could be better described as a Neo-Dadaist. Johns’s appropriation of popular iconography in his work was to be highly influential to later artists, particularly pop artists of the 1960s. He was the lover of Robert Rauschenberg, and for a while they influenced each other’s work. Leo Castelli discovered Johns while visiting Rauschenberg’s studio, and Castelli gave him his first solo show. In some ways it could be said that Johns began to have a greater success than Rauschenberg at this time, and this might have led to a breakdown in their relationship. Both of these artists are among the finest and most influential of American artists. Both have had long productive careers, and they inspired each other to great lengths. Johns’s flag paintings are stunning achievements, and Rauschenberg’s combines are brilliant. Johns’s influence on the American pop artists of the 1960s cannot be understated, but Rauschenberg’s influence on the art world is still a force to this day. If you are a performance artist, conceptual artist, street artist, minimalist, photographer, experimental printmaker, if you do theater sets, etc, etc, chances are Rauschenberg did it first, and for these reason I give this match up to Rauschenberg. Frida Kahlo or Diego Rivera. Frida Kahlo was born in 1907, and died in 1954, and is an artist whose work, with its fantastic dream-like quality and wonderful sense of colour I’ve always found appealing, mono brow and all. Kahlo only began to paint seriously after a bus accident in 1925. She painted to occupy her time while recovering from serious injuries that required a full body cast. Her mother had a special easel made so she could paint in bed, and she used a mirror to paint many self portraits. She said she painted self portraits because she was often alone, and she was the subject she knew best. Personal experiences such as marriage, death, and her many operations became a dominant theme in her work. She painted 143 paintings of which 55 are self portraits. She said she never painted dreams; she painted her own reality. Her paintings, with their bright colours and dramatic symbols, show the influence of native Mexican culture. She was married to Diego Rivera, whom she had been in communication with as a young artist: she had asked his advice about becoming an artist. He encouraged her to continue working as an artist, and they married in 1929. They divorced in 1939 but remarried in 1940. For many years Kahlo was considered a minor artist, and lived in the shadow of Rivera, and it wasn’t until the 1980s that her work became truly well known. She had her first retrospective exhibition outside Mexico Whitechapel Gallery in London in 1982. In later years reproductions of her work have decorated many arts students’ dorm rooms, and her work has been widely reproduced in calendar and greeting card form. 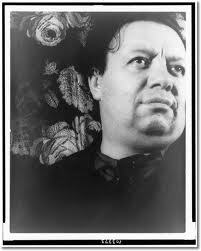 Diego Rivera was born in 1886 and died in 1957. Rivera was a painter, communist, and husband of Frida Kahlo. He traveled widely and spent time in Paris where he experimented with cubism before returning to a form of Post-Impressionism, his work being marked by simple forms and strong colour. He returned to Mexico in 1921 and embarked on his career as a muralist. His work in fresco helped establish the Mexican mural renaissance. He had a retrospective of his work at the Museum of Modern Art in New York in 1931. It is as a muralist that Rivera must be measured. I’ve often found his smaller easel paintings uninspired and his work as a society painter confusing considering his Communist roots. At first when I thought of pairing these two artists I was certain I would give the match up to Kahlo. However looking at reproductions of the truly incredible murals of Rivera I can see how large his influence was on Kahlo, and as wonderful as Kahlo’s self -portraits are, Rivera’s work as a muralist is just too important to ignore, and I will give this match up to Rivera. I invite your comments on these two artists. I simply want to know who you prefer, Pablo Picasso or Marcel Duchamp. 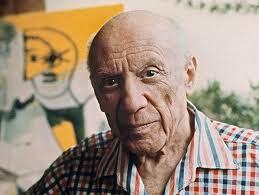 Pablo Picasso was born in 1881 and died in 1973. Picasso is my favorite artist, and he is one of those rare artists who completely changed everything that came after him. He destroyed form and altered how we view the picture plane. He was a child prodigy, and a classically trained artist, who threw away the constraints of being an academy painter and spent the rest of his life exploring and changing styles and media at will. With Georges Braque he invented cubism and papier collé. He was one of the first to use found objects in art. He was a master of painting, sculpture, print making, ceramics, and drawing. Though he constantly explored new styles and media, he had a limited range of subject matter. Most of his paintings are scenes of mythological subjects, still lifes, portraits, or reworkings of paintings by past masters. He also was not a great colourist and rarely deviated from a narrow palette. Famous as the blue period paintings might be, they were blue paintings because he claimed not to be able to afford more expensive colours. He opened the flood gates of modern art but he has few if any significant inheritors. Marcel Duchamp was born 1887 and in died 1968. I’ve always been indifferent about the work of this playful Frenchman. Though I find the ideas behind much of his work interesting, I often find myself wondering if he took his own work as seriously as generations of future art students would. There are pieces by Duchamp that I consider to be great and exciting, The Large Glass of 1915-23 being an example, but they have never really appealed to me on an aesthetic level. His greatest contribution to art was the idea of the Readymade. Readymades were found objects presented as art, the most notorious example being a urinal that he signed “R. Mutt” and entitled Fountain. After 1923 Duchamp was considered to no longer be an active artist. Claiming to have given up art in favour of chess he worked as a consultant to artists, art dealers, and collectors. In the 1950s he was rediscovered by younger artists such as Robert Rauschenberg and Jasper Johns. He had several exhibitions of his work in the 1960s that solidified his position as an influencial artist with younger generations. Duchamp surprised the art world with his final major art work. Entitled Etant donnés: 1° la chute d’eau / 2° le gaz d’éclairage (“Given: 1. The Waterfall, 2. The Illuminating Gas”). Duchamp worked in secret in his studio on the piece from 1946 to 1966 while even his closest friends thought he had ceased to work as an artist. While Picasso is my favorite artist, and Duchamp is an artist whose work doesn’t really appeal to me, I do have to give this match up to Duchamp. Duchamp’s influence on later generations of artists is simply too great to ignore, while Picasso has become someone artists have to rebel against and avoid to escape being labeled as derivative artists. I invite your comments on these two artists. I simply want to know who you prefer, Leonardo da Vinci or Michelangelo Buonarroti. 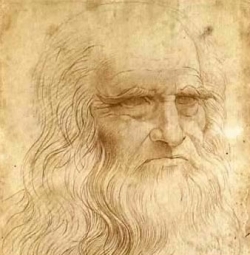 da Vinci was born in 1452, and died 1519. da Vinci was a great draftsman, and scientist, and is best known for the Mona Lisa, and his sketchbooks which he used in his scientific studies. The ultimate Renaissance man, he was a painter, sculptor, scientist, and engineer among other things. In general a man of great curiosity. However he completed relatively few paintings, leaving many unfinished. He never published his scientific findings, which limited their influence on the future course of science. Because of his experimenting with unusual techniques the Last Supper, one of his most famous paintings, started falling off the wall almost as soon as it was completed. 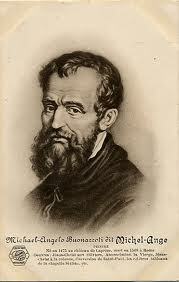 Michelangelo was born in 1475, and died in 1564. Michelangelo was a great sculptor and architect, and is best known for the frescoes on the ceiling of the Sistine Chapel, and Saint Peter’s Cathedral in Rome. Prolific in sculpture, painting, sketching, and architecture, he sculpted two of his most famous works, the Pieta, and David, before he was thirty. However, I find his handling of the female form to be little more than breasts stuck on a steroid enhanced male body. Who would I give this match up to? da Vinci’s famous painting with the lovely smile, the Mona Lisa, is a great painting, but am I alone to think it a bit drab in colour, and static in composition? Could he not get his mind on one thing long enough to actually complete more work? He must have been incredibly frustrating to work with. Michelangelo’s famous ceiling in the Sistine Chapel until recently would also be considered drab in colour, but recent cleaning has revealed wonderful bright colour. His sculpture is some of the greatest ever produced but his handling of the female form is poor. Yet he produced great painting, sculpture, and architecture. He had a great temper, and must have been infuriating to work with.